Cash It – Or List It? There are many simple things people do not consider when selling their home. Often people assume that selling to a cash buyer inherently means a low offer and thus less money pocketed. But have you considered that listing your house on the market means that the house will be on the market on average of 6+ months in this market? During that time insurance needs to be paid still, mortgage, holding costs etc. That can easily run up to 16K in 6 months and that obviously digs into your profits. Thus the longer the house on the market the less net money you will pocket. This is just one example of the simple things people often overlook making decisions concerning selling their homes. We have put together a guide that explains in details all the pros, cons, costs and timeline of each option discussed. 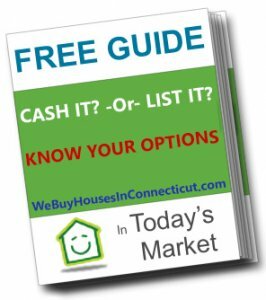 This is a free download that has enormous value to anyone wanting to make an educated decision concerning selling their house. This one is on us! Enjoy! For a very honest evaluation on choosing to sell to us vs listing with an agent please read this article.